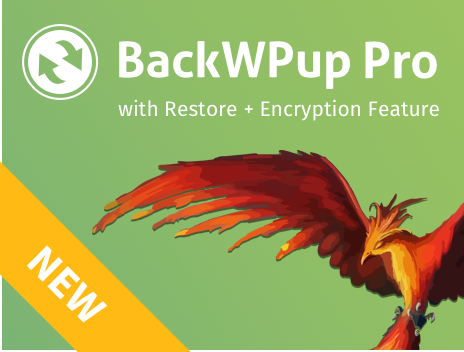 This article explains why we decided to build a BackWPup restore stand-alone app besides to an integration into BackWPup. We discussed this in our team and finally settled with this decision because of vary reasons. Imagine the worst-case: Your WordPress site does not show anything. We call that “White-Screen of Death”. If your not able to log in to see the backend, you’re not able to use a restore feature within BackWPup. Using a stand-alone app can help in this situation. This is our first attempt to build a restore feature and we’re as excited as you. However, developing such a new feature is not always easy. Using a stand-alone app in the beginning helps us to get familiar with the topic and discover general pitfalls. Ok, let me explain that. We build this stand-alone app in such a way, that we can reuse parts of it later in BackWPup Pro. So that means, the code, which is responsible for restoring a backup is not only build for this app but also for the plugin later. So we won’t have to rebuild everything in the near future when integrating it into BackWPup. We decouple the part, which handles the restoration from the part, which shows the GUI (Graphical User Interface) in browsers. Learn how to install the BackWPup restore stand-alone app.